HI BOB! Here are my ramblings about one of my favorite subjects:MAICO'S!!!!!!!!! 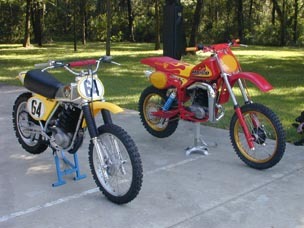 My story really starts in 1974 when I got my first Maico, a 74.5 GP 400, what a great bike! 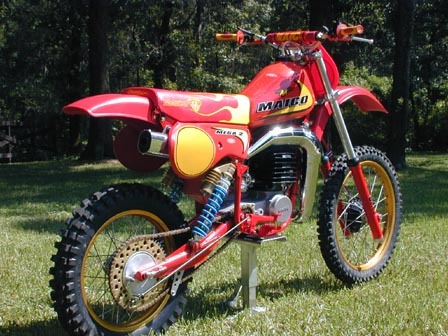 The best thing about Maico's back then was it made guys like me, who only had fair riding skills, look good AND win some races! We raced a lot of TT tracks around Tampa, Fl. and MX in NC and SC, but I really loved the TT's, smooth, big fast sweepers and a few jumps! Then I put a 501 in the bike and discovered third gear starts and big holeshots! After two more years and a couple of more Maico's and a few broken bones, I drifted away from dirt bikes and started racing cars. My 74.5 was the only bike I kept along with the 501 motor and ended up in the corner of the shop for about 23 years. That brings us to present day, after selling my last race car and looking for something to do, I spot the 74.5 in the corner in pieces and the motors on the shelves, MAICO PROJECT!! Then I go to the Internet and to see if I could find anything and I find the MAICO MADNESS page and my life has not been the same since! Not only do I restore the 74.5, I find a 81 490 on your site, not to mention all of the other valuable info you provide for which all Maico owners greatly appreciate, THANKS BOB!!!! Now on to the 81 490, The bike was in good shape when I got it, even rode it around before taking it apart. I repainted frame and forks, sent hubs to Eric@ MaicoOnly for the full powdercoat treatment,SS spokes,reanodizing and a new Wheelsmith pipe he makes. Eric also tricked out the forks. Went through the motor and clutch with parts from NorthWest Maico&CZ,also new tank, plastic, and Works piggybacks from Rick. As the parts started coming in, I knew something was missing, this old hot-rodder started thinking. Bingo! CHROME and FLAMES!!! That's what I needed to set this 490 apart from all of the other trick ones I've seen. So I chromed the pipe. clamps, bolts, nuts, axles, chain adjusters, kickstart lever, fill plug on trans, and clutch arm. Then I sent the seat off to Gravesmotorsports for a flamed seat and I polished everything else made of aluminum. That's about it, now I guess I'll have to go check out the Ocala vintage track that I've been hearing about, 'cause this thing really hauls some serious A!!! 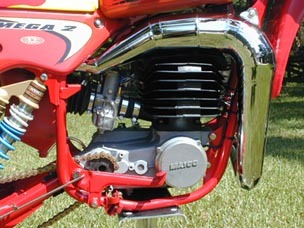 Thanks for all the help and long live MAICO!!! Did I mention the 76AW 440 and the 75 501 I'm working on now? I've got to say these two bikes are fantastic, thanks for sharing them with us. You really know how to pull off a great restoration / customization. Can't wait to see the 501 and the 440.